There’s one question people who rock the holidays always get: How. Do. You. Do. It? For starters, a lot of very serious planning. See our notes here. Once the planning is out of the way, preparation beings. It’s crazy to believe that one person can prepare a meal for 10+ people in just a day. No. It takes days of work, and weeks of advance preparation a little bit at a time. Just yesterday, I was visiting with one of my best friends. While I was putting the final touches on the meal planning for Christmas Eve and Christmas Day, she was making homemade turkey stock for Thanksgiving. Why? Because it’s one less thing to worry about when you’re in the final countdown. There are several make ahead recipes that will make it to my holiday parties this year, including these delicious Classic Meatballs. Make ahead recipes are life savers. They’re great for weeknight dinners, hosting friends and family for impromptu dinner parties, and for holidays. Meatballs are a crowd pleaser and they store really well. There are so many different things you can do with them too. Create a make-your-own meatball sandwich bar with different topping options like cheese and roasted peppers. Display them on a nice platter with a shot glass full of toothpicks nearby for an easy appetizer. Toss them together with a giant pot of spaghetti. The options are endless! We have had meatballs at Christmas since I can remember. 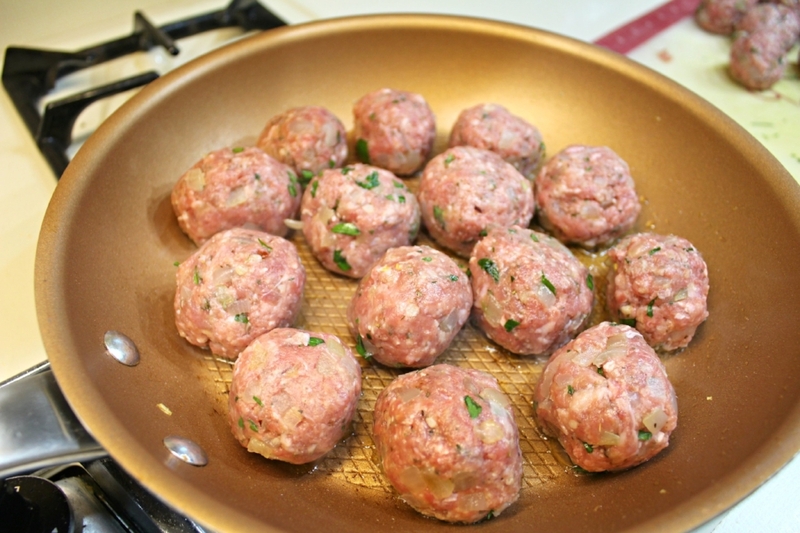 We have classic meatballs, similar to this recipe here, we have meatballs with raisins, and naked meatballs (no gravy). They’re a very DIY food option which works exceptionally well for families of picky eaters. Meatballs are traditionally made with three types of meat in equal portions: ground beef, ground veal or lamb, and ground pork. For this recipe, the meat is scaled down to just two: beef and pork. They are the most cost effective of the meats, the easiest to find and the most important. Lamb will add a nice gamey-ness to the flavor and veal a tenderness but ground beef and pork together is generally a winning combo. Cook the onions and garlic before mixing the meatballs. This is a nice trick because it allows the flavors of those two ingredients to develop properly. It also reduces the risk of getting a crunchy piece of onion in your meatball...gross...as well as extra moisture in the meatballs. For the breadcrumbs, I used panko because that’s what I had on hand but any breadcrumb will work. It acts as the binding ingredient so that the meatballs don’t fall apart. Those are the main points when it comes to making meatballs. Two pounds of meat should make 24 meatballs if you portion them out right (I only got 23 thanks to the two giant ones that I got lazy with). You can bake these naked for storage. If you plan to serve them right away, I like to cover the bottom of a baking dish with gravy (aka, spaghetti sauce), and set the seared meatballs on top for baking. The gravy gets a little meaty from the meatballs and the meatballs stay super moist because of the gravy. It’s a match made in heaven. They can store in the refrigerator for a few days or in the freezer for a few months. A few important things to remember...1) let them cool completely before storing. If the meatballs are still warm, you risk condensation which can also lead to freezer burn. 2) Store them in airtight containers or sealable bags. This also will help prevent that dreaded freezer burn. 1 - In a large skillet, heat the olive oil over medium heat. Add the onion and garlic. Saute until soft, about 8 minutes, and let cool. 2 - In a large bowl, mix together all of the remaining ingredients along with the cooked garlic and onions. Once mixed, roll into 1.5-inch sized balls. Place the skillet back over a high heat and brown the meatballs. Move to a preheated 375 degree oven and bake 15-20 minutes until cooked through. TO STORE: Let the meatballs cool and store in an airtight container or sealable bag. Save in the fridge for up to 4 days, in the freezer no longer than 3-4 months. TO WARM: If frozen, dethaw the meatballs in the fridge overnight. Pour gravy into a baking dish with the meatballs. Warm in a 325 degree oven for 5-8 minutes before serving.